For the purpose of uncertainty propagation a new quadrature rule technique is proposed that has positive weights, has high degree, and is constructed using only samples that describe the probability distribution of the uncertain parameters. Moreover, nodes can be added to the quadrature rule, resulting into a sequence of nested rules. The rule is constructed by iterating over the samples of the distribution and exploiting the null space of the Vandermonde-system that describes the nodes and weights, in order to select which samples will be used as nodes in the quadrature rule. The main novelty of the quadrature rule is that it can be constructed using any number of dimensions, using any basis, in any space, and using any distribution. It is demonstrated both theoretically and numerically that the rule always has positive weights and therefore has high convergence rates for sufficiently smooth functions. The convergence properties are demonstrated by approximating the integral of the Genz test functions. The applicability of the quadrature rule to complex uncertainty propagation cases is demonstrated by determining the statistics of the flow over an airfoil governed by the Euler equations, including the case of dependent uncertain input parameters. The new quadrature rule significantly outperforms classical sparse grid methods. van den Bos, L.M.M, Sanderse, B, Bierbooms, W.A.A.M, & Van Bussel, G.J.W. (2018). 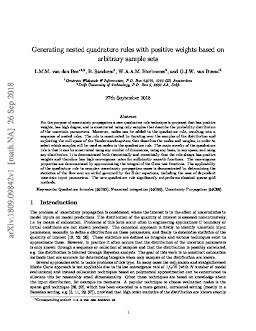 Generating nested quadrature rules with positive weights based on arbitrary sample sets.